The Chester County Bar Foundation (CCBF) awards two $5,000 scholarships annually to provide financial assistance for post-high school education of a student interested in pursuing a career in law or a law related field. Payment of the scholarship award shall be made directly to the successful applicant’s college or university. Scholarship award winners will be recognized at our Law Day Luncheon which is held on the first Friday of May each year. Applicants for the Scholarship Award must demonstrate academic excellence, wide ranging extracurricular activities, leadership, dedicated community service and an interest in and intent to pursue a career in law or a law related field. Financial need will also be considered for the Hon. Charles B. Smith Scholarship. To be eligible, an applicant must be a citizen of the United States. Also, the applicant must be either a permanent resident of Chester County or enrolled in a high school located in Chester County as a senior. Each of the eligible organizations in some manner furthers the mission of the Foundation to help Chester County citizens understand, gain access to and benefit from our legal system. The Foundation will provide the Scholarship Award recipient the honor of selecting the beneficiary of the matching grant in further recognition of the recipient’s proven dedication to benefit others through community service. Bayard Rustin High School, and was presented during the Annual Law Day Celebration. When a scholarship is named after an individual, that person’s legacy as a role model is perpetuated. Oftentimes, a name alone is meaningless, unless you have a name like George Washington or Abraham Lincoln. 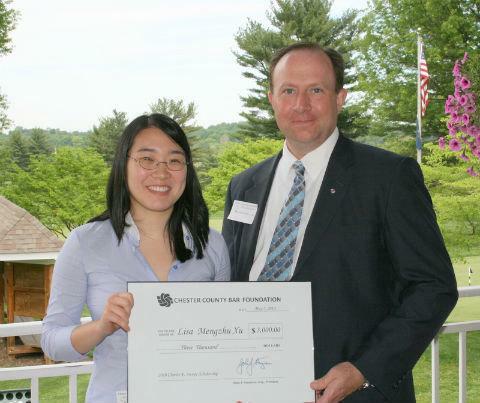 The Chester County Bar Foundation established the Charles E. Swope Scholarship in memory of a great American. Charles Swope was known by many names reflecting his many accomplishments. Colonel Swope was his name to fellow Marines; Dr. Swope was his name to educators; Mr. Swope was his name to his fellow employees, but Charlie, was also his name to everyone. Charles Swope joined the Marine Corps Reserve in 1948, rose from the rank of Private to Colonel, and completed 40 years of active and reserve service, and was even awarded the Legion of Merit Medal by President Reagan. Out of his many distinguished titles, my favorite was Colonel, since he commissioned me a Marine Corps Second Lieutenant when I graduated college. Colonel Swope served as President and CEO of The First National Bank of Chester County for over 30 years, and was the youngest president elected at age 41. Not only was he a Marine Corps leader, a bank leader, a director on countless Boards of Directors, but he also served as president of the Board of Trustees of West Chester University, president of the Rotary Club of West Chester, the national president of the Marine Corps Reserve Officers Association where I remember that he even paid my first years’ dues! He received numerous professional and community service awards to include awards from the Boys Scouts of America, Chester County Historical Society, the State System of Higher Education, the Chamber of Commerce of Greater West Chester, and the Chester County Chamber of Business and Industry. It is so important that young people today have role models to serve as a guiding light through their journey of life, and to follow in the footsteps of Charles Swope, is a great honor. I know he was a role model for me. And now that we know a little about the life of Colonel Swope who passed away in 2003, let’s now find out which high school student is exemplified by his legacy. The Honorable Charles B. Smith served on both the State and Federal Bench. Born in Philadelphia, he was a graduate of Philadelphia's Central High School (209th class) and Dickinson College. At Dickinson he was a member of the Alpha Chi Rho fraternity and a member of Skull and Key, an honorary society for juniors. He went on to Dickinson School of Law and graduated with honors in 1965. Thereafter he entered the military and served in the U.S. Army Judge Advocate General Corps. He had tours of duty at Fort Benning, Georgia; Brooke Army Medical Center, Fort Sam Houston, Texas; and lastly at Valley Forge General Hospital, Phoenixville, Pennsylvania. Upon discharge from active duty in 1970, he remained in Chester County to raise his family and start his career as a lawyer. In the early 70s, he became a community activist and was the first paid legal-aid lawyer, building a program that was not wholly dependent on bar association funding but part of the growing nation-wide legal services model. He was a board member of Chester County Cares, and President of Chester County’s Community Action Board and the Legal Services Corporation. In 1976, he was appointed by the Common Pleas Court to serve as its first Juvenile Court Master and as Mental Health Review Officer; it was this appointment that occasioned his judicial aspirations. In 1981 the opportunity presented itself, and he was appointed by the Governor and elected to the Court in the fall. He left a law firm then known as Smith, Lachall, Brion, Fetter and Cohen. Judge Smith became the seventh judge on the Chester County bench and in addition to his trial duties, he supervised the workings of the Juvenile Court. Judge Smith remained in the U.S. Army Reserve during his first term and retired in 1990 from his position of Commanding Officer of the 184th JAG Detachment in Harrisburg. He retired as a Lieutenant Colonel. After his retention election in 1991, there was a vacancy on the Federal District Court, and he was elected by that bench to serve as a U.S. Magistrate Judge. The Judge served on that court until his retirement in 2007. He retired as Chief Magistrate Judge of the U.S. District Court of Eastern Pennsylvania. At that point he took the status of Senior Judge in Chester County’s Court of Common Pleas and worked part-time as well as making himself available in surrounding counties where coverage was needed. Judge Smith passed away in 2018 and this scholarship was established in 2019 in his memory.